At the end of each baseball season, Ned Yost goes home to his 700-acre spread in Georgia, where he can close the gate behind him, settle into his blind and hunt. It is his sanctuary, a place where he is at peace, jettisoning the scrutiny and sleepless nights that accompany him during the season. Yost expected it to be the same last winter, when the team he manages, the Kansas City Royals, came agonizingly close to winning the World Series, the seventh game ending when catcher Salvador Perez fouled out with the tying run at third base. One day turned into one week, then one month, but the sting did not abate. When Yost returned to Arizona for spring training, the disappointment still felt like a kick in the gut. For his players, it served as a spur. The Royals knew the only way to salve their regret was to win the World Series, and Sunday night at Citi Field they accomplished it in a very Royal-like manner, with a come-from-behind 7-2 victory in 12 innings over the Mets. The victory, their fourth in five games, gave them their first championship since 1985. The Royals survived a superb performance by the Mets’ Matt Harvey, scoring twice to tie the score, 2-2, in the ninth and breaking through to score five times in the 12th inning against relievers Addison Reed and Bartolo Colon. For a team that has been defined by its derring-do on the basepaths, it was fitting that the game turned on the bold base running of Hosmer, who dashed home with the tying run in the ninth inning on an infield groundout when Mets first baseman Lucas Duda’s throw home was wide of the mark. 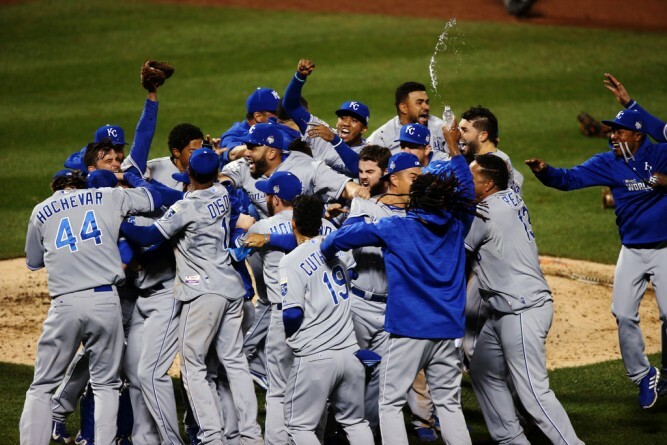 The winning rally also had innocuous roots: a bloop single by catcher Salvador Perez, a stolen base by the pinch-runner Jarrod Dyson, a productive groundout by Alex Gordon that moved Dyson to third and a line single to left by the pinch-hitter Christian Colon, who was making his first appearance in the postseason. Then the floodgates opened. Doubles by Alcides Escobar and Lorenzo Cain brought home four runs, sending fans toward the exit and the Royals awaiting the coronation, which came when Wade Davis struck out Wilmer Flores for the final out, sending the Royals storming out of the dugout. It was the Royals’ eighth come-from-behind win in the playoffs, including all four in this series. The Royals had been held scoreless against Harvey until the ninth. But after Cain walked to begin the inning and stole second base, Hosmer doubled into the left-field corner to cut the Mets’ lead to 2-1 and closer Jeurys Familia relieved Harvey. Mike Moustakas moved Hosmer to third with a groundout and Perez grounded to third baseman David Wright to begin the critical sequence. Wright, who ranged to his left to snag the ball, froze Hosmer by looking back, and threw to first baseman Duda. As he did, Hosmer broke to the plate, but Duda’s throw — which would have been in time to get the final out — sailed wide of catcher Travis d’Arnaud. As it did, Hosmer slid across the plate and popped up, slapping his hands and charging toward the dugout, where he was mobbed by his teammates. It was the type of aggressive base running that has put the Royals’ opponents on their heels. Cain scored the pennant-winning run against the Toronto Bl;ue Jays by racing home from first base on a single, and the Royals stayed alive in their division series against Houston when Astros shortstop Carlos Correa hastily misplayed a potential double-play grounder. Until Hosmer’s dash, Harvey had owned the night from the moment he stepped to the mound and struck out Escobar, the Royals’ pesky leadoff hitter. The capacity crowd rose to its feet frequently, waving orange towels and letting chants of “Har-vey, Har-vey” echo throughout the stadium. Harvey carried the crowd’s energy and rode it like a wave through the middle innings. When he struck out the heart of the Royals’ order — Cain, Hosmer and Moustakas — in the fourth, the last pitch a 98-mile-an-hour fastball, he shook his fist and let out a scream. He struck out three more in the fifth, though he did allow a walk. Harvey used all four of his pitches — fastball, curveball, slider and changeup — masterfully, keeping the ready-to-hit Royals off balance and out of sorts all night. Most important, he did so efficiently, keeping his pitch down manageable enough so that Manager Terry Collins, who was criticized for his use of the bullpen in Saturday night’s loss, could give Harvey the opportunity to finish. It was an opportunity Harvey pleaded forcefully for with Collins as the Mets were batting in the bottom of the eighth. In case Collins needed any additional prodding, fans who watched the conversation take place took up Harvey’s case by chanting his name. When he hopped up the dugout steps and sprinted to the mound to begin the ninth, the stadium roared once again. It was a dramatic turn for Harvey, who for the last two months has brought to the mound something beside his gifted right arm and comic-book nickname. He carried with him an anvil-like question, one that cuts to the heart of any competitor, especially one whose persona, the Dark Knight, has been crafted around relishing the biggest stage. When his agent, Scott Boras, raised concerns in early September that the Mets were compromising Harvey’s long-term prospects, it put Harvey — who missed last season with elbow surgery — in the uncomfortable public position of having to weigh in on two agendas that did not necessarily dovetail: his long-term future and the Mets’ current prospects. Then, early in the playoffs, Harvey was late for a workout, arriving bleary-eyed and saying he had overslept. Those matters were reduced to piffle Sunday. When he left, to a standing ovation after 111 pitches, there was little questioning that Harvey had given his best — and his all. 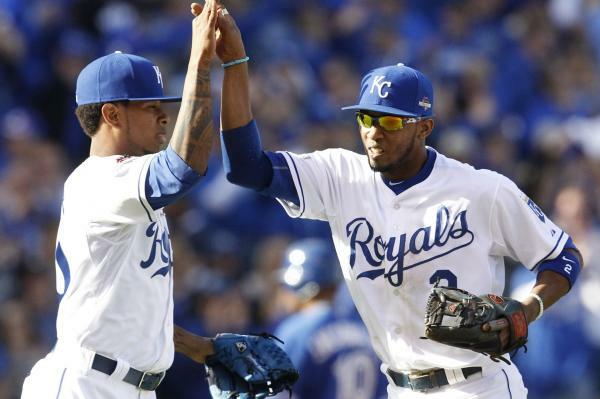 If Harvey’s performance was redemptive, Royals starting pitcher Edinson Volquez’s was inspirational. Volquez, who started the Series opener, learned after he left the game on Tuesday that his father, Daniel, had died earlier in the day from heart failure. Volquez returned to the Dominican Republic for his father’s funeral, then rejoined his teammates in New York just before the start of Game 4. “I’m pretty sure my dad is going to be proud of me when I pitch tomorrow,” Volquez said Saturday night. Volquez was nearly Harvey’s equal. He allowed two hits in six innings, though he walked five and allowed both runs, one of which was earned.